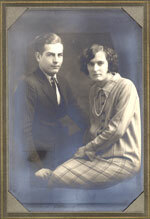 c. 1929-1930. 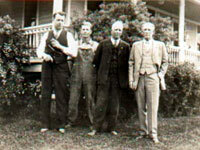 (left to right) Edgar Danial Yankie, Charles Ashton "Charlie" Yankie, sons of Jay Trimble Yankie (pictured 3rd) and J.T. 's brother, Homer Yankie in front of the house at the Yankie Farm, Ransom Rd., Breckenridge, MI. c. 1929-1930. (back row, left to right) Homer Yankie, Charles Ashton "Charlie" Yankie, Edgar Daniel Yankie, Jay Trimble (John) Yankie. (front row left to right) Robert Lane Yankie and Edgar Jay Yankie, sons of Edgar Daniel Yankie. c. 1925. 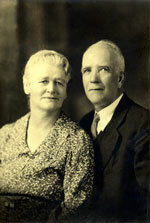 Charles Ashton "Charlie" Yankie and his new bride Mary A. Lowrey Yankie. 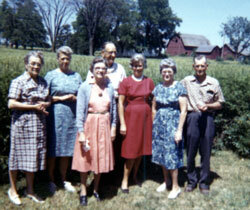 The Yankie kids in the 1963 Yankie Reunion Photo (left to right): Evelena Yankie Schurr, Esther Jane Yankie Braik, Frances Isabel Yankie Prather, Edgar Daniel Yankie, Alyce Idona Yankie Randau, Ethel Irene Yankie Alward and Charles Ashton Yankie. 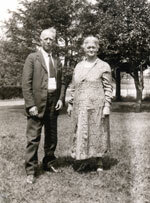 Ruth Angeline Yankie Anderson died in 1961. Standing in the yard of the Yankie Farm.